It is one of the most successful planters in Argentina. Created in 1991, it has undergone some changes in form but not in content. With a slogan which marked the beginning of a transformation process:“THE ARGENTINIAN PLANTER FOR ARGENTINIAN SOILS”. 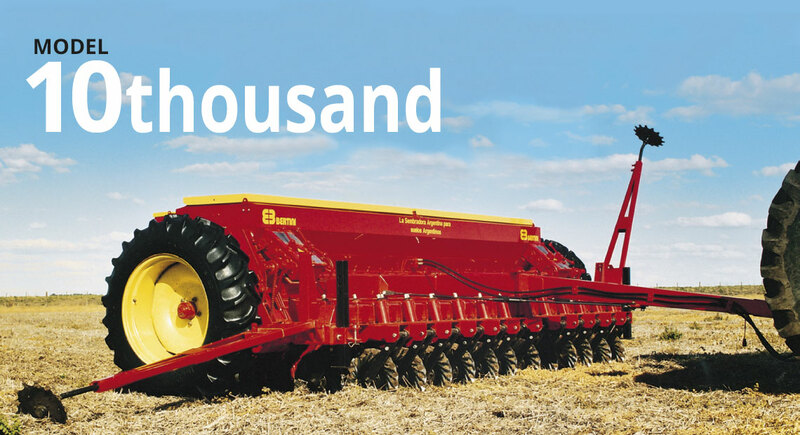 The change from conventional to no-till farming was a reality and this 10.000 model can be perfectly used for conventional sowing and then convert it for no-till cultivation. More than 14 years have passed, and for many reasons this seeder model has kept its leading role in the market... 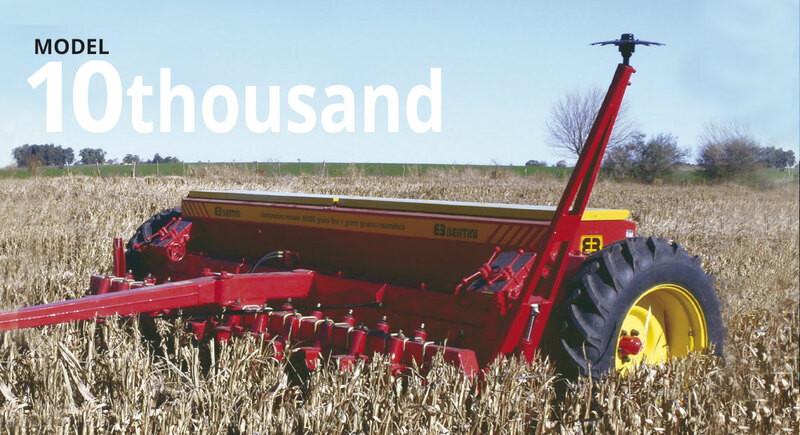 The high resale value of used planters places 10.000 model as a widely wanted and well-known machine in the market. In order to do that and from the beginnings of its manufacturing, the characteristics which achieve these aims have been kept intact. 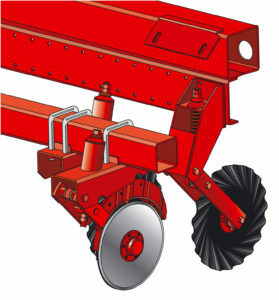 Ploughing blades, very narrow-angle double disc, covering V-shaped cog discs, fertilizer and seeds hopper (standard), very versatile for any type of soil because it employs the lever principle to transfer load to the coulters from the counterweight under the platform, stable and strong, easy and low maintenance, prepared to sow wheat, soya, corn and alfalfa, to fertilize in and out of the line. 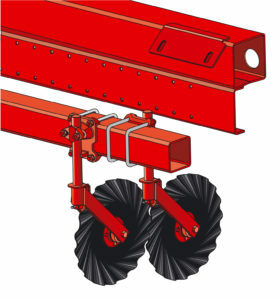 12.4 x 28 wheels (big diameter) are placed in the same line which the 25 furrow openers sow, making it light to draw and of excelent operation in flooded areas. 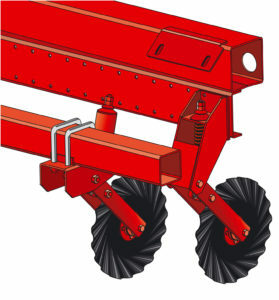 The seeder has a standard hopper divided into two by a plate, like a partition. The position of the partition determines different fertilizer and seed volumes. 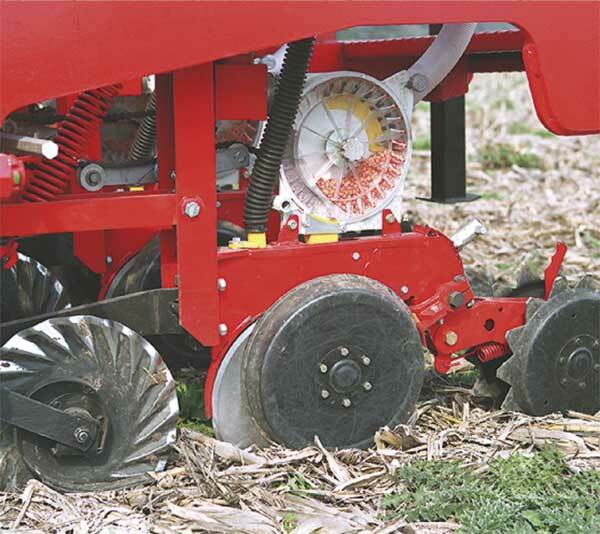 The double disc opener includes a tube for fertilizing in-line seeding. This practice is employed when using starter fertilizers or low dosis, so seeds are not damaged. 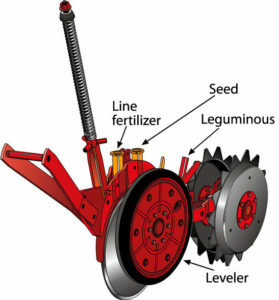 When high dosis which may affect cultivation are needed, fertilizers should be applied on one side of the seeding line. To do that, a fertilizer hopper can be placed on the tool bar, and the corresponding double discs for application can be placed on the bar. 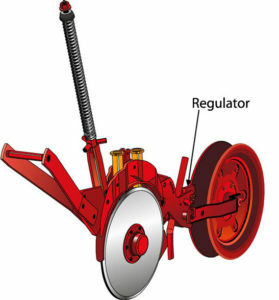 The seeder owns a large capacity hopper divided into two parts, one for seeds and the other for fertilizers. 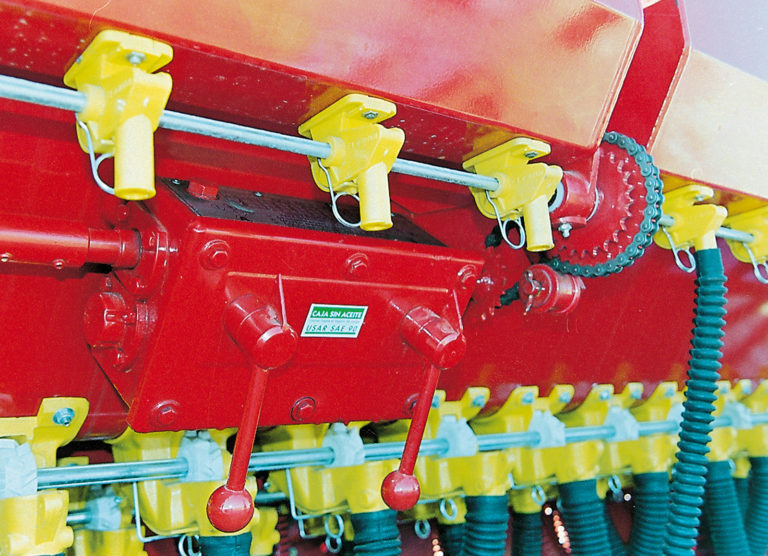 Plastic box and seed hoppers distribution system with chevron-type wheel, allow for precise and constant regulation of seeding rates in time. 25 double disc furrow openers at 17.5 cm distance. It lifts and lowers the chassis, transferring all weight to the microbalance coulters. 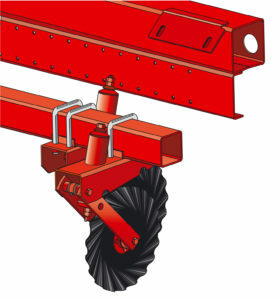 It lifts and lowers the chassis by means of 2 hydraulic cylinders with piston rods – this guarantees the scanning of the land, the use of the tool bar and the use in no-till as well as in conventional farming. 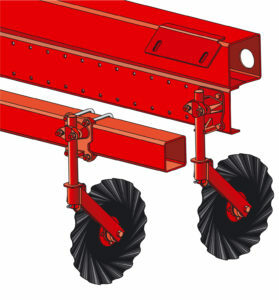 Provided with 12.4 x 28 tyres. One or two strategically placed counterweights guarantee a 4,000 kg tare. This machine can be assembled with different support and coulter configurations according to the areas and jobs to be carried out. Typical configuration that has 13 coulters to chassis and 12 to bar; useful for future incorporation of discs for applying lateral fertilization. Very common configuration for having all equal supports; but little chance for lateral fertilization (wheat). Used when soil surfaces have logs or stones (clearing in the north or hardpan in the hills); little chance for lateral fertilization (wheat). Configuration that distributes 13 coulters to chassis and 12 to bar. Used for soil surfaces having logs or stones; foreseen future incorporation of lateral fertilization (wheat). Our seeders offer the possibility of placing a double-disc furrow opener and a fertilizer hopper on the tool bar in order to carry out lateral fertilization. This is the same previous configuration with fertilization discs. Double disc with rear V-shaped cog wheel, made of boron steel, quenched and tempered. Lateral wheel for depth control. Double disc with rear V-shaped cog wheel, made of boron steel, quenched and tempered, with cog cam for depth control. Double disc with straight, positive semiautomatic rear wheel, made of iron and rubber, and cog cam for depth control. Double disc with straight, negative semiautomatic rear wheel, made of iron and rubber, and cog cam for depth control. The alfalfa distribution system is of maximum precision. Plastic helicoidal distributors driven by gearbox offer accuracy in time and minimum quantities from 1kg per hectare are possible. 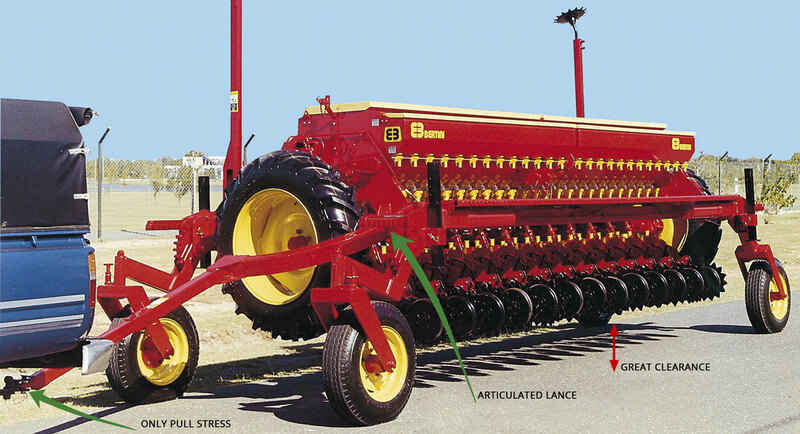 Desired depth is achieved by means of continuous adjustment, controlled by the delivery tube in the seeding unit.